New extensions, theme & pricing changes. 1st October 2018 / Calum Allison / Comments Off on New extensions, theme & pricing changes. This week we will be releasing two new extensions, making the theme (beta release) available for purchase and making some change to pricing. The first week of October we will be releasing two new extensions: User Groups and User Photos. The User Groups extension allows users to create and join groups around shared interests, topics etc. Users can post and have discussions within the groups. The User photos extension allows users to create and upload photos to their user profile. The beta release of the theme will also occur in the first week of October. If you purchase the theme during the beta period you will get a 2-year license for the price of a 1-year license. With the release of the new extensions and the theme, we will be making some changes to our pricing models. We will be replacing the extensions bundle with an extensions pass and introducing a new extensions + theme pass. The extension pass provides the exact same features of the current bundle (access to all premium extensions and unlimited site usage) but the access pass will only require one license key rather than the current system where each extension has a separate license key. 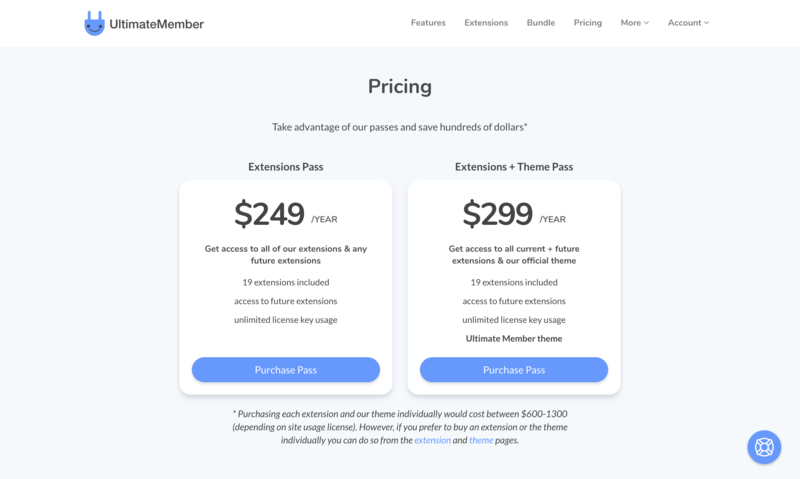 The extensions + theme pass provides access to all premium extensions and our official theme for one single price. Our prices have not increased for 3 years but to ensure the long-term sustainability of the business and to allow us to grow the team (faster development and support) we will be increasing the prices of our extensions. With the access passes it works out at buying each extension for only $13.10 ($249/19). This is a small increase of $1.40 from $11.70 ($199/17). Purchasing the theme via the access pass offers a 50% saving compared to buying the theme individually. The theme will also be available for purchase individually (starting from $99/year for a single site license). Whilst we’ve tried to avoid increasing prices for the last few years, it is important that we have the ability to grow the support and development team as every year support increases significantly as more people use the plugin. These changes are designed to ensure that Ultimate Member is here for the long-term and allows us to provide a better plugin and service in the future. These changes will occur in October. For existing customers, you will be grandfathered into the existing pricing. Customers with an active bundle license, you will be moved onto the extensions access pass. Want to keep up to date with all that is happening with Ultimate Member? If so follow me on Twitter to receive the latest updates.